Behold the sword of the Lord will descend suddenly and quickly upon the earth. The Pope may err, and that in two ways, either because he is erroneously informed, or from malice. As to the latter cause we leave that to the judgment of God, and believe rather that he has been misinformed. In our own case I can prove that he has been falsely persuaded. Therefore any one who obstinately upholds the excommunication and affirms that I ought not to preach these doctrines is fighting against the kingdom of Christ, and supporting the kingdom of Satan, and is himself a heretic, and deserves to be excluded from the Christian community. Io vi conforto di convertirvi a Dio, vivere come è obbligato ogni buon cristiano, dolervi del passato e ridurvi alla pietà. Altrimenti, io vi annunzio che è sopra di voi imminente un gran flagello, e sarete flagellato nella roba, nella persona e nella casa vostra. Vi annunzio ancora, che della vostra vita ce n' è per poco; che, se non farete quel che vi dico, anderete nell'inferno; e questa lettera vi sarà presentata innanzi al tribunale di Dio, nè vi potrete scusare. I counsel you to return to God, to live after the manner of a good Christian, to repent the past, and recur to piety. Otherwise, I make known to you that severe chastisement awaits you, and that you shall be scourged in your substance, your flesh, and your kindred. Likewise I announce to you that your life is near its end; that if you obey not my words, you will go to hell, and this letter will be brought up against you before the judgment-seat of God, and leave you no way of escape. To the prince of Mirandola, Count Galeotto Pico, brother of Giovanni Pico della Mirandola (26 March 1496), as quoted in Life and Times of Girolamo Savonarola (1888) by Pasquale Villari, translated by Linda Villari, p. 442; also in Le lettere di Girolamo Savonarola (The letters of Jerome Savonarola), 1933, Roberto Ridolfi, L. S. Olschki, p. 107. E fu in quel tempo che io montai quassù, e dissi che io non era mandato a predicarti da uomo del mondo, né da signore alcuno, ma da colui che è signore dei signori e dalla santa Trinità. I was not commissioned to preach by any man in this world, nor by any lord, but by Him who is the Lord of lords and by the Holy Trinity. Sermon of 18 February 1498, as quoted in Material for a History of Pope Alexander VI, His Relatives and His Time, 5 vols., (1924) by Monsignor Peter de Roo, Bruges, Desclée, De Brouwer, volume 3, p. 265. Basic searches to find frequency and page number of specific words and phrases for all five volumes at HathiTrust. Jérôme Savonarole: d'après les Documents Originaux (Girolamo Savonarola: According to the Original Documents), 1856, François Tommy Perrens, Paris, appendice, p. 352. Ee quello che volesse fare Parlamento sarà de' Signori, gli sia tagliato il capo; se è altri, sia ribelle e confiscatigli tutti i beni … che quando i Signori vogliono fare Parlamento … e ognuno li possa tagliare a pezzi senza pena. If he that would summon a Parliament be of the Signoria, let his head be cut off; if he be not of it, let him be proclaimed a rebel and all his goods confiscated; … should the Signoria seek to call a Parliament … all may cut them to pieces without sin." The best, and the worst, that can be said of the tempestuous friar is that he loved God so passionately that he had very little love left for man. Dizzy flights of fancy abounded in Savonarola's discourses and took the place of calm and logical exposition. 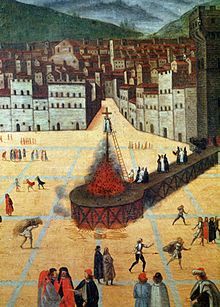 The terrorism exercised by Savonarola and his adherents grew daily more and more intolerable. The prophet declared that no one could be a good Christian who did not believe in him. Dizzy flights of fancy abounded in Savonarola's discourses and took the place of calm and logical exposition. On the evening before he preached his last sermon in Advent, 1492, Savonarola beheld in the middle of the sky a hand holding a sword with the inscription, Behold the sword of the Lord will descend suddenly and quickly upon the earth — Ecce gladius Domini super terram cito et velociter. Suddenly the sword was turned toward the earth, the sky was darkened, swords, arrows and flames rained down. The heavens quaked with thunder and the world became a prey to famine and death. The vision was ended by a command to the preacher to make these things known. Again and again, in after years did he refer to this prophetic vision. Its memory was also preserved by a medal, representing on one side Savonarola and on the other a sword in the heavens held by a hand and pointing to a city beneath. The inscription on the heavenly sword well represents the style of Savonarola's preaching. It was impulsive, pictorial, eruptive, startling, not judicial and instructive. And yet it made a profound impression on men of different classes. The preacher himself was burning with religious passion. He felt deeply and he was a man of deep devotion. He had the eye of the mystic and saw beneath the external and ritual to the inner movements of spiritual power. The biblical element was also a conspicuous feature of his preaching. 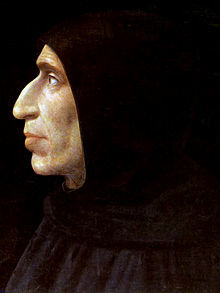 Defective as Savonarola's exegesis was, the biblical element was everywhere in control of his thought and descriptions. … He insisted upon the authority of Scripture. "I preach the regeneration of the Church," he said, "taking the Scriptures as my sole guide." Savonarola was not merely the expounder of righteousness. He claimed to be a prophet revealing things which, to use his own words, "are beyond the scope of the knowledge which is natural to any creature." This element would have been a sign of weakness, if it had not been associated with a great personality, bent on noble ends. The severity of his warnings was often so fearful that the preacher himself shrank back from delivering them. On one occasion, he spent the entire night in vigils and prayer that he might be released from the duty of making known a message, but in vain. The sermon, he then went forth to preach, he called a terrific sermon. This page was last edited on 21 July 2018, at 17:16.